With electric vehicles, 120 photovoltaic solar panels, a solar thermal system for heating his pool, geothermal home heating and cooling, and a wind turbine, Stephen Taylor takes a stand for energy independence. In the world of plug-in cars, the Nissan Leaf and Chevy Volt may get all the attention, but a new arrival will make it very much a three-car race. The 2012 Toyota Prius Plug-In Hybrid is just now arriving at Toyota dealers in California plus a dozen or so other states. 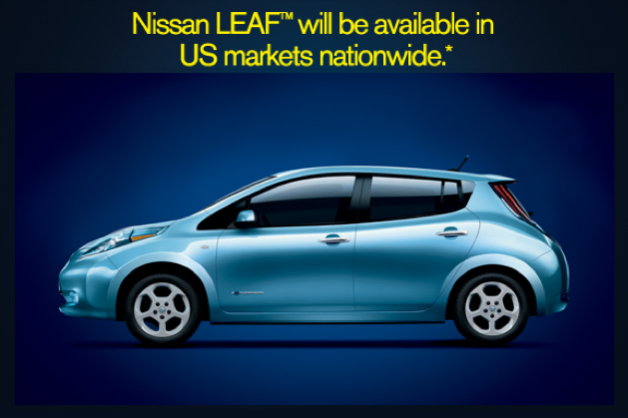 FRANKLIN, Tenn., Feb. 29, 2012 /PRNewswire via COMTEX/ — Beginning tomorrow, drivers across the country will have their first opportunity to order their Nissan LEAF, as Nissan North America Inc. (NNA) expands availability for all U.S. markets, nationwide. 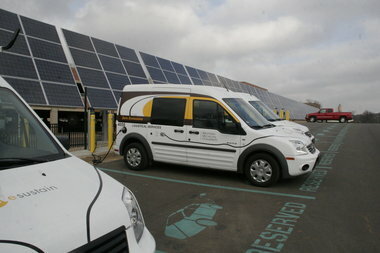 KALAMAZOO – Western Michigan University officials say 20 electric vehicle charging stations are now connected to the university’s power grid and available to the public free of charge. Electric carmaker BYD Automobile said it would consider building a multi-storey charging tower in Hong Kong if the government provided land and policy support. USA: Can battery companies help drive an economic comeback in Las Vegas? With Nevada looking to diversify its economy, a group of little-known companies appears to hold promise in the field of rechargeable lithium batteries. One such company, K2 Energy Solutions Inc., of Henderson, has gained regional and national attention in recent months. NIPPON SHOKUBAI CO., LTD. [Tokyo Stock Exchange – TOKSE:4114.T] (“NIPPON SHOKUBAI”) hereby announces that it has developed a commercial production process of a new electrolyte for lithium ion battery, Lithium bis(fluorosulfonyl) imide (“LiFSI”) by using innovative fluorination reaction. The commercial production of LiFSI is scheduled to start in 2013. USA: Battery innovation is alive and well in the U.S. The government of Canada, through Canada Economic Development’s Business and Regional Growth program, has made a $200,000 repayable contribution to AddÉnergie Technologies Inc to assist the firm to begin commercializing its charging stations for electric and plug-in hybrid vehicles in Canada, the United States and France. USA: Motiv Power Systems Secures $1.16 Million California Energy Commission Grant, Demos New Battery-Electric Truck at Work Truck Show in Indianapolis. GREENVILLE — One of the world’s foremost professional associations will meet in South Carolina next week when the Institute of Electrical and Electronics Engineers (IEEE) holds a prestigious first-of-a-kind conference in the Upstate. From March 4-8, more than 1,000 people are expected to attend the 2012 International Electric Vehicle Conference. HONOLULU (WTW) — Hawaii’s electric vehicle drivers will have free access to more than 130 charging stations across the state through the end of 2012. Electric car network provider Better Place says it is activating the state’s largest electric vehicle charging network on Oahu, Maui, Kauai and the Big Island, including at hotels, office buildings and shopping centers. Motorists who drive electric cars now have a place to plug in and recharge in Lexington after the town has installed new charging stations. The charging stations, located in the parking lot off of Edison Way in Lexington Center, were turned on in a ribbon-cutting ceremony held by the town Monday evening. A New York-based company is at least the second in the past year to pitch a system that refills an electric vehicle’s battery in a way similar to how conventional cars are refueled at gas stations, according to GigaOm. USA: Make way for the electric car: Which cities do it best? With gas prices topping $5 per gallon in some states, the case for electric vehicles (EV) is more compelling than ever. USA: Corbin Tries To Resurrect Sparrow Electric Car. Would Anyone Care? Back in the mid 1990s, a motorcycle seat salesman by the name of Mike Corbin turned up at the San Francisco Auto Show with a single seat, three wheeled electric car that resembled a boot on wheels. The much anticipated Prius Hybrids with the plug-in option made their U.S. landfall in Benicia. The cars were part of a shipment delivered to the Amports facility by the Pyxis Leader, a Panamanian flagged vehicle carrier. Plugincars.com reported the first Prius plu-ins arrived last weekend but officials at Amports said the first cars actually arrived in mid February. Toyota’s new Prius Plug-In Hybrid has become the “most efficient” vehicle in its British fleet. Officials at the Japanese manufacturer have announced that the eco-friendly car will be able to travel 134.5 miles on a single tank of petrol. That would get a driver from Leeds to Birmingham without having to stop off to refuel. The FINANCIAL — Ever heard the saying “Happy wife, happy life?” Chevrolet Volt owners, especially with two in their households, have found this to be especially true. Samsung Electronics Co. will partner with BMW to combine more of its technology with the German vehicles’ battery and in-car software, Samsung said on Wednesday. Lithium Americas Corp. (TSE:LAC) (OTCQX:LHMAF) said Monday it has completed a 3D brine numerical model, used to simulate brine extraction from its Cauchari-Olaroz lithium-potash project in Argentina, which confirmed the size and production capacity of the resource.